There is no scientifically valid mechanism for CO2 causing global warming. Co2 does not hold in heat! Carbon dioxide absorbs all radiation available to it in about ten meters. More CO2 only shortens the distance, which is not an increase in temperature. In other words, the first 20% of the CO2 in the air does most of what CO2 does, and it doesn't do much. • The carbon dioxide greenhouse effect provides a scientifically valid mechanism. CO2 produces a warming effect not by soaking up the radiation in its immediate vicinity, like a sponge, but by raising the effective radiating level of the atmosphere to a colder layer. • The atmosphere doesn't act as a single unit, but is made up of hundred of different layers. Some of the energy radiated from Earth is stopped in each of these layers. The energy is then re-radiated in a random direction, but on average the energy is moving either "up" or "down." The atmosphere gets thinner as altitude increases, so eventually the radiation will reach a layer high enough and thin enough to escape to space. • If you increase the concentrations of a greenhouse gas in the atmosphere, the thin upper layers will become more opaque and thus absorb more of the IR; therefore the place where the majority of the energy finally escapes moves to a higher level. These higher levels are much colder (until you reach the stratosphere, but as most infrared photons escaping to space are emitted by the troposphere, this can be ignored), and so they do not radiate heat very well. Thus the rate that radiation escapes to space is lower, and the planet will take in more than it radiates. As the higher levels emit some of the excess downwards, the lower levels will warm all the way down to the surface. • The imbalance will remain until the higher levels get hot enough to radiate as much energy back out as the planet is receiving. "As a dam built across a river causes a local deepening of the stream, so our atmosphere, thrown as a barrier across the terrestrial rays, produces a local heightening of the temperature at Earth's surface." • The Earth's climate is a complex and dynamic system that is subject to a multitude of different forcings on many different timescales. The fact that the climate can change and has changed independently of carbon dioxide does not mean that carbon dioxide cannot change the climate. It simply means that some other force, be it an increase in solar output, a change in the planet's albedo, etc., has overwhelmed the forcing signal from carbon dioxide. • In 1991, for example, after the eruption of Mount Pinatubo, there was a sharp drop in global temperature following the massive outpouring of ash from the volcano. This sudden increase in air born particulate matter briefly overwhelmed many other forcing factors and drove the temperature down by several degrees until the ash settled out of the atmosphere. This is just one of many examples of a short term forcing managing to overwhelm a longer term forcing, such as an enhanced greenhouse effect. - Global temperatures have often changed in parallel with CO2 increases over the Earth's history. We know this from the fossil record and measures of trapped gas in the ice caps. We know that CO2 is a greenhouse gas. So, even if the CO2 does not come exclusively from human emissions (i.e. not anthropogenic) we are currently experiencing an increase in it and this is linked to climate change. At least SOME of the increase can be attributed to human activities either directly or indirectly (Burning of fossil fuels is direct. Deforestation is less direct. Etc.). Changes in land use and urbanization may contribute more to changes in the average ground temperature than “global warming” caused by human emissions. There are probably other factors which are contributing to the warming effect, both natural and man-made. However, calculations also show that the rise in temperature can be easily explained by the increased levels of CO2 in the atmosphere. Until another compelling explanation is put forward, this would seem to tbe the most likely cause. Also, just because something else could be causing global warming doesn't mean that it is. The public is being misled through propaganda to assume CO2 is like a sheet of plastic holding in heat. CO2 can only absorb 8% of radiation frequencies available (No one disputes this. ), and only about 1% of the heat leave the earth as radiation--the other 99% being conduction, convection and evaporation. NASA says its 41%, not 1%, but there is no agreement, and night vision equipment shows there is very little infrared radiation given off by normal temperature matter. • All of the energy flowing from Earth to space is necessarily in the form of electromagnetic radiation. Earth is floating in a vacuum, making it physically impossible for it to lose energy through conduction or convection. So while much of the energy moving across the planet's surface is not in the form of radiation, it is the only form of energy important in determining the planet's temperature–the planet's temperature being determined by the ratio of the flux of outgoing terrestrial radiation to the flux of incoming solar radiation. • Also, carbon dioxide is an effective absorber in the infrared spectrum. Due to its temperature, Earth radiates energy primarily in the infrared spectrum. So while carbon dioxide may fill a small absorptive window, it fills a very important one. Equilibrium is rapid and total as indicated by many sources of evidence. One, the graph for CO2 in the air is an extremely precise line. If nothing were regulating, it would vary wildly. Two, if equilibrium were not established, oceans would be absorbing or losing CO2 at a high rate, yet no detectable change occurs beyond the stab in the dark guess that it might have dropped 0.15 pH units over the past century. Oceans do absorb atmospheric CO2. And under normal conditions the oceans and the biosphere will generally keep the amount of CO2 in the atmosphere constant. However, human activities are producing CO2 at a much higher rate than the planet's oceans and biosphere are able to absorb it. This imbalance is responsible for virtually the whole of the 20th century rise in CO2. Also, estimating pH changes need not involve any stabbing in the dark thanks to fossil records and certain species being restricted by pH (e.g. shelled molluscs) due to their physiological requirements. And 0.15 pH units may not sound like much but pH is measured along a logarithmic scale. •	Computer simulations are not real-world data and cannot be relied on to produce reliable forecasts. Data is usually inputted by persons looking for specific outcomes. See http://www.landshape.org/enm/ for more information. • Surface monitoring stations are not the only evidence that the planet is warming. satellite data, radiosondes, borehole analysis, glacial melt observations, sea ice melt, sea level rise, proxy reconstructions, and permafrost melt all conclusively show that the planet has undergone a pronounced and rapid warming over the past century and a half. So even if the entire surface temperature record were contaminated beyond use, there would still be no doubt whatsoever that the planet is warming. • Aside from this, it has been demonstrated in several independent studies (Peterson, 2003) that the urban heat island effect does not significantly affect the surface temperature record. That is, the 20th century warming trend is not simply an artefact of urban development. • It is also important to note that the warming trend is not an output of a computer model, but a conclusion based upon observing real-world evidence such as that listed above. World expert in analysis of stochastic and hydrological processes, professor Demetris Koutsoyiannis, has shown that the models have made no valid predictions during the last 20 years; McKitrick, McIntyre and Herman have shown the model predictions of temperature exceed the observable trends by as much as 300%. Ferenc Miskolczi's 3 papers, in 2004, 2007 and 2010 show that the greenhouse effect has not changed in the last 61 years, therefore proving that the slight heating which has occurred over the 20thC has not been due to greenhouse gases such as CO2. Being one of the heaviest gas molecules in the atmosphere CO2 stays low, hugging the ground and allowing plants to photosynthesize. Have you ever heard of plants thriving in the higher atmosphere? According to the climate change theories, the biggest problem is the CO2 which is somehow getting into the higher atmosphere, this way creating the greenhouse effect. Now, how can a very heavy gas rise up where there's little or no air? I'd like to see a mechanism that allows the CO2 gas to be high up and low down at the same time. People I asked about this gave at least a whole page of "facts" that none of which made sense and are often contradicting each other. Truth shouldn't be complicated. If it is, it's probably a lie. Among other factors which may be responsible for climate change, human action is generally regarded a strong contribution – and one which looks set to increase, particularly in light of the swift industrialization of certain large nations, such as China. There may not be time to wait. Climate change interferes with ecosystem functioning and resources provided by the 'natural' environment. For example, rainfall in the tropics is largely created by the rainforests themselves, the potential for pharmaceuticals being discovered, timber resources etc. These have been valued at US $33 trillion. This is compared to a global GNP of $18 trillion. The adverse economic effect of taxing carbon dioxide production in an effort to control "CO2-induced" global warming will be substantial. Poverty will be created and wealth will be destroyed. Nothing is worse for the environment than poverty. People in poverty don't care a whit for the environment, they just want to feed their children. Examples of this throughout the world, and in cities everywhere, are abundant. Environmental protection is considered an unaffordable luxury when people are poor. With the global economy on a knife-edge, it is no time to hold back-- we should all be fighting against those who are incapable of recognizing that the cause-effect order is not established for CO2 and temperature... Indeed, the DATA themselves more strongly support that CO2 rises occur as a result of temperature increases, and that our addition to CO2 in the atmosphere will have no effect at all that is predictable from the previous data..
Anthropogenic effects on climate change are accepted by more than 99% of climate scientists. The longest, high resolution datasets in the world are land and sea surface temperature, collected since the 1860s, the errors of which have now been statistically corrected (Folland and Parker, 1995). Since the advent of climate modeling since the early 1990s, technology has improved so rapidly that scientists are now able to isolate the different forcings of climate change, and have shown unequivocally that natural variability, sun spots and volcanic activity are not able to explain the rise in global temperature, and that anthropogenic emissions of CO2 (which have been monitored in Hawaii since 1957) is the only plausible explanation for the additional, catastrophic rise in temperature. An idea isn't validated by how many scientists accept it, but by the veracity of the evidence supporting it. It is perfectly possible for many scientists who accept or reject the theory to be wrong. • Using sound and well understood physical principals, scientists are able to construct accurate and reliable models of Earth's climate which they can then use to "hindcast" past climate changes. They have discovered that when only natural factors are included, the models do not accurately reflect the 20th century climate change. It is only when both natural and anthropogenic factors (such as CO2) are considered that the models present realistic results. • Scientists have also been unable to discover any natural forcing-such as changes in solar output-active during the past century sufficient to have produced the bulk of the 20th century warming trend. "A small change in cloudiness over the rest of the Earth's surface can be far more important than major changes in the area of the ice caps. It is important to keep such things in perspective. Climate modelers have a distinct tendency to focus on a sensational minor topic while neglecting the major topics of climate. Clouds and cloudiness are the major factors in the Earth's climate. Clouds rule the Earth's climate. Everything else, including the atmospheric greenhouse gases, is marginal." Please remember that "consensus" among scientist is when they leave the building still speaking to each other. What entity/individual has determined the current 360 ppm of CO2 in the atmosphere vs roughly 250 ppm pre-industrial revolution is the optimum level for life on earth (both mammal and vegitation) ??? Some data indicates that at about 160 ppm plant life on earth would wither and die. Climate models do not include the effect of cloud formation because it is almost impossible to model their effect on earth's climate. If it were possible for man to control CO2 in the atmosphere and return it to pre industrial levels and that descision proved to be wrong would it be easy to return to the optimum levels ?? Remember the earth's climate/weather is a dynamic, always changing and the so-called MMGW is more of a political ploy for more control over peoples lives than anything else. Model input data in some cases has been tweeked to arrive at a predetermind conclusion because the reuslt wasn't what the researcher wanted !!! All of the points in the 'yes' camp are bunkum and easily dismissed. 1. There is no scientifically valid mechanism for CO2 causing global warming. It *could* be, but then again the Universe *could* be made of pixie dust too. While there are still one or two competing theories out there - cosmic rays and solar cycles are about the only examples that still have some academic backing - nobody has come close to developing any kind of satisfactory alternative model, most of the ideas have been tried and tested and found to be flawed. Whereas the standard 'greenhouse' model is based on 150 years of research and observation, it's physics are very well understood, in fact to overturn the greenhouse model you would have to rewrite physics because everything we know about the heat trapping properties of CO2 supports the greenhouse model . That's why 98% of researchers in the relevant fields agree with the tenets of AGW as outlined by the IPCC . 4. Co2 does not hold in heat! True but misleading. Oceans also lose their capacity to absorb as the turn more acid from increased Co2 absorption. This is global warming sister crisis, even if CO2 didn't cause the globe to warm we would still suffer an ecological catastrophe as the oceans acidify, as is already being observed, and lose their capacity to maintain life. Add to this the fact that at the same time as dramatically increasing CO2 output we have also significantly depleted the planets biomass, further reducing the natural carbon cycle to absorb the excess being produced by human activity (currently about 60% of our emissions are being naturally absorbed back into the carbon cycle ). But at any rate, the whole argument is an inconsequential distraction from the reality of the situation: we know for a fact, quantifiably so, that CO2 concentrations have increased by about 37% since pre-industrial times, which is certainly higher than at any point in at least 800,000 and almost certainly a lot longer than that , and we can identify that the increase is a result of human activity through chemical fingerprinting of the gasses . It is blindingly obvious that CO2 levels are rising faster than the planets ability to absorb them. 1 Svante Arrhenius's experiments with radiation passing through air in a test-tube does not establish that CO2 can warm air. Arrhenius made several mistakes in his experiment; Firstly, he used radiation of 9.7 microns; CO2 primarily affects radiation at 14.77 microns; water is the dominant greenhouse gas at the radiation band Arrhenius used, so what he proved is that water vapor can cause heating. Secondly, Arrhenius believed the glass tube he used was impervious to inra-red radiation; it isn't which is where the misnomer of the greenhouse effect comes from; what warms a greenhouse is the absence of convection which is what Arrhenius also measured; glass like CO2 absorbs and reemits radiation instantly; CO2 does not delay or block radiation; what CO2 does do is collisionally transfer some energy to the relatively inert gases, N2 and O2, which make up 99% of the atmosphere; but even this is a relatively minute heating effect with the vast bulk of the atmosphere being heated by conductive transfer with Earth's surface. The Earth's average temperature is 288K; the greenhouse temperature is 33K of that total and CO2 supplies less than 1/2 of that, and human CO2 about 3% of that 1/3. The basic lie of CO2 causing the recent warming or any warming is that CO2 warming is infra-red or long-wave [LW] based; LW cannot warm the oceans; it does not have the energy to penetrate water; since the warming of the world is ocean based [see Compo and Sardeshmukh, White and Cayan,Stockwell and Cox] this warming cannot be due to CO2. 3 The " standard greenhouse model" is fundamentally flawed as Gerlich and Tscheuschner [G&T], Kramm and others have shown. The criticism G&T have received from the likes of Foster and Halpern has been ill-conceived because this criticism did not understand that G&T were explaining the basic difficulties in measuring the flawed and ill-conceived greenhouse concept; as noted this concept has never been adequately explained. "The exception proves that the rule is wrong." That is the principle of science. If there is an exception to any rule, and if it can be proved by observation, that rule is wrong." Science is not decided by majority vote; it is an oppressive concept which shows the desperation of the AGW supporters. 4 The CRU climate scandal and many other examples of fudging and fraud by the AGW camp clearly establish that there is a concerted effort to manipulate data to conform to AGW. Only recently the NIWA, which prepares New Zealand's official temperature record using methods similar to Australia's official temperature, was successfully sued on the basis of that record being manipulated and adjusted unfairly. There is clear evidence that the Australian record has also been manipulated, as has the official IPCC record from GISS. This is wrong. 5 A final point; wiki, real climate and skeptical science are authorities for nothing; these are all pro-AGW sites which are completely partisan and therefore not reliable. Tamino goes on to make 2 main charges against Watts and D’Aleo; the first is that they are stupid for asserting that by getting rid of colder, rural stations NOAA has produced a cooler temperature trend; if indeed that is what D&A did assert they would be silly; what they did say is that by getting rid of the colder sites the average temp over the whole site range would be warmer; nothing about trends. Now the GMST is the benchmark of AGW; people can gesticulate and hand-wave about trends but if the temp, the GMST, is warmer then you have an argument which supports AGW. And that is what removing the colder sites accomplished. Tamino side-steps this by putting up a GISStemp graph showing no temp drop at the time of the removal of the colder sites; but this is a anomaly trend graph; it shows the change in temp of the remaining sites not the change in GMST created by the absence of the cold sites. 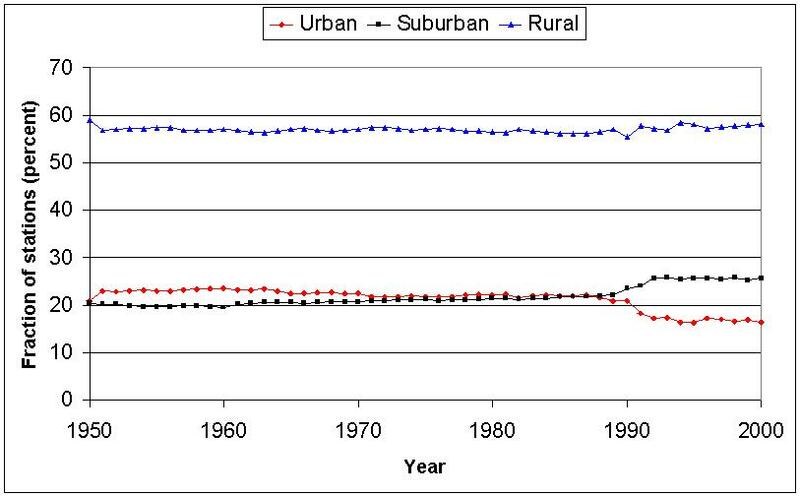 There is a drop in urban sites but that is more than matched by an increase in suburban sites; in % terms the rural station increase has been exceeded by the combined increase in suburban and urban stations. The only conclusion is that Watts' original critique of the official temperature record is correct and that Menne's attempt to legitimise that record was ill-conceived. The oceans comprise the bulk of the Earth's surface. From what I have read, It takes full wavelength sunlight to warm the oceans. Atmospheric CO2 does not warm the oceans. The thermal aspect of CO2 vs the other atmospheric components suggests increases in CO2 should actually be somewhat neutral or have a cooling effect as it displaces water vapor. So, the energy is reduced via a lower humidity and is not imbalanced as claimed. This has now been verified in the upper Troposphere where more heat is found escaping into space. So, warming effects ascribed to CO2 increases are offset via reduced water vapor. From a % point, this would render the effects of atmospheric CO2 as almost negligible. In order to better understand what the earths atmosphere does it is instructive to widen ones view to take account of all planets with an atmosphere.Thanks to NASA and space probes we have quite a lot of information about other planets. Therefore from the data set of measurements on all those planets and earth we can consider different explanations for how planets get the measured surface temperature. Many people forget that we are all living in a very strong force field. It’s called gravity. I know it’s strong as a saucepan fell off the top of a cupboard today and landed on my head and it hurt. All planets have gravity. Consider what effect gravity has on gaseous atmospheres. We can work it out from basic physics. I won’t go into all the mathematics here (you can look it up) but one gets a temperature gradient which has the bottom of the atmosphere hot (or very hot in the case of Venus) and the top cold. The Gravity Induced Temperature Gradient explanation is consistent with known physics, consistent with all known data from all the planets we have measured, provides a simple explanation for surface temperature on the earth and the other planets and requires no greenhouse effect from any gases including CO2. We therefore have a simple and elegant explanation for not only earth but other planets which provides a refutation of the alleged greenhouse effect. There are some who dispute that gravity can introduce a non isothermal effect, indeed this is an argument that has been going on for decades. The majority opinion is that a column of gas in a gravity field must become isothermal. Belief in a Gravity induced Thermal Gradient is a minority opinion. The matter should be solved by proper scientific experiment. It has been done. This field is very new, post 2007 really,but a few experiments have already shown results consistent with the gravity explanation. None have failed to show it. More work is required but it does look like the evidence is stacking up in favour of this new (old really-dates back to Maxwell !)hypothesis/theory. If evidence continues to build (as I expect it will) in favour of Gravity Induced Thermal Gradient then clearly if that is the correct explanation for observations then there is indeed no such thing as a greenhouse effect. An interesting deduction from this is that we could construct a device using gravity and temperature differences to provide “free” power. in fact some have already been made, they do work, the output is electricity but only mW currently as the devices are small. We possibly have the prospect of being able to construct Gravity Powered Generators if we scale it up and have pollution free power for ever. A very exciting proposition. That is the mechanism we were taught at school Badger, before post modern climatology, it is still how a basic GCM works in meteorology, add a greenhouse effect and they run too hot. Has he overlooked anything? Like co2 absorption is temperature dependent and thus equilibrium is temperature dependent. So IF atmospheric co2 does cause warming then it could become a self-reinforcing process where small contributions could have an effect. About 40 minutes in he gives a graph that shows population growth as almost exactly matching CO2 graph line. If there IS a problem then it looks like sheer numbers of people rather than what fuel they use that makes the main contribution. Take a look at orbital control of climate, a speleothem study by Matt Lachniet. You can remove #3 from your no list. We are within the natural range of variability for this point in time. So much for humans are causing most of the warming. Where did you get your yes no list at the start? The no list should include the opposite of pretty much each of the no points, Just saying the yes list is bunkum doesn’t really do the job. The argument against the question is based on the fact there is a scientifically valid and measured mechanism for CO2 to slow the passage of heat energy through the atmosphere. The yes list is just false or a partial statement which is irrelevant.